Crashed Funeral: Tasteless Joke, or April Fool's Fun? Improv Everywhere's latest prank: Crashing a burial at Brooklyn's Green-Wood Cemetery. It's a joke, but is it funny? Improv Everywhere's Best Funeral Ever. Ha? Improv Everywhere, the group known for creative disturbances of the peace like the No-Pants Subway Ride (which now takes place in nearly 20 cities every year) and Best Gig Ever (in which a completely unknown band found itself playing to a roomful of "fans" it didn't know it had), had us going with its Best Funeral Ever video. 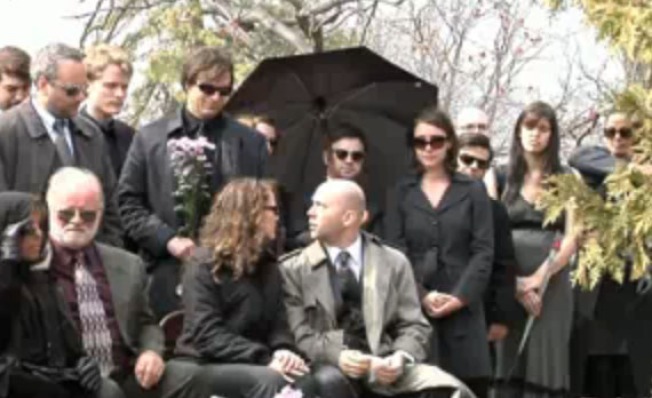 Nutshell: The Improv Everywhere crew scoured obits for a funeral they figured would be attended by very few, and then showed up with a group of "mourners" 30 strong, baffling the deceased's friends and family. It's an April Fool's joke, but is it funny? Check out the video of the "prank" over at Gothamist, where we heard about IE's shenanigans.